Description: Turgen Gorge in the Ili-Alatau National Park (90 km from Almaty) is an ideal place to enjoy the beauty of nature. The gorge has hot springs, a trout farm, waterfalls and thick forests. Rich in coniferous and mixed trees, alpine and sub-alpine meadows, lakes and springs, medicinal herbs and berries, the gorge plunges 44 km into the vast Assy plateau (2,560m). Long ago, caravans from Europe and Asia passed through the "Royal Gates" on their way to China and India. The broad valley stretches east for 60 km. 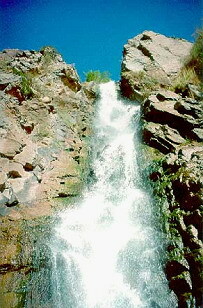 The Turgen Gorge is well known for its seven waterfalls. The Medvezhy (Bear) falls drop 30 meters in a beautiful setting amidst overhanging cliffs and green fir trees, while the Bozgul Falls, known for the force of their water, have worn away an entire tunnel in the rock. Another notable feature of the gorge are the ancient Chin-Turgen mossy fir forests which cover the ground and form a thick wall of trees. The most popular spot in the Turgen Gorge is Boten, the hunting base. Here, where three rivers meet, the gorge is at its deepest - 920 meters. The Turgen river flows southwest, while the Kishi-Turgen runs southeast. There is an observatory on the plateau. Ancient burial mounds and rock drawings are dotted along the Asy river. The are quite a few Sacae and Usun graves in the gorge, dating from 500 BC-300 AD. Resorts such as Sinegorye and Tauturgen are located where hot springs flow into the rapid Turgen river. The Sinegorye, situated 1,50 0m above sea level in the scenic Mirushino gorge (70 km from Almaty), offers a wide choice of accommodations. The small mountain lakes above the Sinegorye are wonderful for bathing and fishing, while lower down is a trout farm where you may catch your own fish and cook them for supper.